Photos of the PLASMADYNE 1000 from 3DT LLC show A) stationary head, B) rotating head and C) assembled system. Images courtesy of 3DT LLC. From top, plasma surface pretreatments conducted at ambient conditions: A) electrical air plasma spot treatment, B) atmospheric plasma and C) classical electrical corona discharge. Images courtesy of 3DT LLC. Atmospheric pressure plasmas are commonly used to improve polymer adhesion. The increased surface energy and improved wetting characteristics lead to significant adhesion improvements with adhesives, coatings and inks that cannot be attained without surface treatment. A recent advancement introduced by 3DT LLC enables variable plasma discharge power control. Adjustable power is an important feature when treating sensitive and/or thin polymeric substrates and printing low viscosity inkjet inks. There are different electrical design approaches for generating and controlling plasma power output. This article discusses the mechanics and kinetics of atmospheric plasma pretreatment applications and equipment configurations. Classical electrical corona discharge and electrical air plasma processes are compared. Atmospheric plasma effectively pretreats most polymer substrates, including acetals, polyolefins, nylons, polycarbonates, rubber/elastomers and more. Atmospheric plasma or electrical blown ion plasma (also termed focused corona plasma) utilizes a single narrow nozzle electrode or rotating electrode, powered by an electrical generator and step-up transformer, and high-pressurized air in which intense focused plasma is generated within the treatment head and streams outward. This pretreatment process can clean dirt, debris and some hydrocarbons from the substrate, but not most silicones and slip agents. New research indicates fine etching of the surface can create new topographies for increased mechanical bonding. Ozone formation is negligible. High volume, in-line production integration options are limitless since the process is not conducted under vacuum pressure (Low Pressure Cold Gas). The mechanism and kinetics of atmospheric plasma continues to be studied. The way that these plasma sources treat materials is unique in that a beam of reactive species is produced that scans across the surface. The surface undergoes a dynamic change with time that depends on the density of radicals in the beam, the beam size and the scan rate. Some experts observe that certain polymers treated in the remote afterglow region of an atmospheric pressure plasma avoid the thermal effects that can cause degradation for thermally sensitive materials, when placed in direct contact with the plasma. Reactive (oxygen-containing) and inert (oxygen-free) atmospheric plasmas rapidly impart adhesion enhancement by orders of magnitude as measured by 180° peel tests. Some studies suggest extended exposure to the atmospheric plasma does not impart additional adhesion enhancement as the surface is ablated revealing the underlying polymer with poor adhesive characteristics. Adjustable (variable) plasma discharge power can be accomplished in a couple of scholarly reviewed methods including varying formations of the signal input (i.e., changing frequency), or varying the number of pulse signal applied to parallel electrodes in unit time, termed pulse-density-modulation (PDM). The former method is typically incorporated when output power exceeds 100 watts. The latter method is highly effective for steady state plasma power control below 100 watts. As demonstrated to this author, 3DTs PLASMADYNE 1000 (Stationary or Rotating) PRO SYSTEM can be customized with one or more stationary or rotating heads. The internal air pressure blower provides the necessary air for the plasma treating head. (Note, some plasma equipment manufacturers alternatively incorporate high pressure compressed air. There can be treatment differences between the two designs that require examination of the treatment effectiveness by application.) Each single stationary head (S configuration) shown in Figure 1A treats an area of 10-15mm in width. Variable power adjustment from 300 to 600 watts. Each single rotating head (R configuration) shown in Figure 1B allows for a treatment area of 15-40mm. Variable power adjustment up to 500 watts. The plasma treatment head & mounted generator panel (cabinet) are shown in the assembled system configuration Figure 1C. PlasmaDyne Pro is currently the only system on the market to offer adjustable treatment and power levels, according to 3DT LLC. In addition to atmospheric plasma, other commonly known gas-phase plasma surface (modification) oxidation processes conducted at ambient conditions include: electrical corona discharge (also known as a dielectric barrier discharge), electrical air plasma, flame plasma and ultraviolet irradiation/ozone. Each method is application-specific and possesses unique advantages and potential limitations. Examination of the polymer (amorphous or semicrystalline), plasma mechanics and kinetics, bonding agents and manufacturing processes requires careful examination and testing. The selection of which method to utilize on any given application can be challenging, in part due to misconceptions and confusing terminology. (Note: Low-pressure cold gas is conducted under vacuum; therefore, it is not discussed in this article. Flame plasma, Pyrosil and UV-ozone will be presented in future papers). Classical electrical corona discharge (dielectric barrier discharge) is obtained using a generator and electrode(s) connected to a high-voltage source, a counter electrode at potential zero and a dielectric used as a barrier. That is, a high-frequency, high-voltage discharge (step-up transformer) creating a potential difference between two points requiring earth ground 35+kV and 20-25kHz. Ozone is produced. See Figure 2C. Electrical air plasma is a corona discharge spot treatment (also termed blown air plasma/forced air corona/blown arc). This treatment head consists of two hook electrodes in close proximity to each other connected to a high-voltage transformer generating an electric arc of approximately 7 to 12kV, and lower frequency 50 to 60 cycles/sec (relative to electrical corona discharge). Then using forced air, a continuous electric arc produces a corona discharge  plasma. No positive ground is needed. This pretreatment process has virtually no cleaning capabilities. Ozone is produced but at lower level than electrical corona discharge. See Figure 2A. The underlying reasons why many plastics are difficult to bond are because they are hydrophobic non-polar materials, chemically inert and possess poor surface wettability  i.e., low surface energy. While these hydrophobic (repel water) performance properties are ideal for part designers who seek such properties, they are the nemesis for manufacturers needing to bond such materials. Robust adhesion bonding usually necessitates hydrophilic surfaces. For optimum adhesion to occur, an adhesive (coating, ink or paint) must thoroughly wet out the surface (adherend) to be bonded. Wetting out means the liquid flows and covers a surface to maximize the contact area and the attractive forces between the adhesive and adherend bonding surface. For a liquid to effectively wet out a surface, the surface energy of the adhesive must be as low or lower than the surface energy of the adherend to be bonded. Alternatively, the surface energy of the substrate must be raised. Surface tension, a measurement of surface energy, is expressed in dynes/cm (SI N/m). The higher the surface energy of the solid substrate relative to the surface tension of a liquid (water, printing inks, adhesives/encapsulation, coatings, etc. ), the better will be its wettability and the smaller will be the contact angle. As a rule, acceptable bonding adhesion is achieved when the surface energy of a substrate is approximately eight to 10 dynes/cm greater than the surface tension of the liquid. Specific to adhesion of low viscosity UV inkjet inks onto polymer surfaces, experts have found that the optimal range between 48-56 dynes typically yields better adhesion and inkjet print quality. Higher surface energies greater than 60 dynes can cause dot separation, particularly on cylindrical products, such as writing instruments. In other words, achieving water-wet 70 dynes is not necessarily advantageous. 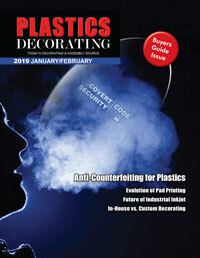 For additional information pertaining to Plasma Surface Pretreatments of Polymers for Improved Adhesion Bonding, reference the April/May 2018 issue of Plastics Decorating. Scott R. Sabreen is founder and president of The Sabreen Group, Inc., which is an engineering company specializing in secondary plastics manufacturing processes  surface pretreatments, adhesion bonding, decorating and finishing, laser marking/laser welding and product security. He has been developing new technologies and solving manufacturing problems for more than 30 years. Sabreen can be contacted at 972.820.6777 or by visiting www.sabreen.com or www.adhesionbonding.com.